Waltheof of Northumbria, last of the Anglo-Saxon earls, was the son of Siward the Strong, Earl of Northumbria and Aelflaed, daughter of Ealdred, Earl of Bernicia, who was the son of Uhtred the Bold, Earl of Northumbria. Siward the Strong, a larger than life character, was probably of Norse origin and emerged onto the pages of history during the reign of the Viking King Canute. In 1054, Waltheof's elder brother, Osbjorn, while accompanying his father on campaign in Scotland, was killed at the battle of Dunsinane, while fighting in support of the claims of Malcolm Canmore, son of Duncan, King of Scots, against King Macbeth. His brother's untimely death left Waltheof, who was the second son, as his father's heir. The great warrior Earl Siward, reported by contemporaries to be a giant of a man in stature, died not in battle, but much to his disdain, in his bed, of dysentry in 1055, during which he bemoaned the fact that instead of dying in one of the many battles he had fought in, he was forced to die like a cow. He insisted on being dressed in his battle armour, with helmet on his head and axe and shield in hand so he could end his days like a warrior and thus attired went to meet his maker. As his heir Waltheof, was at the time still a young child, King Edward the Confessor appointed Tostig, the unruly brother of Harold Godwineson (the future Harold II) as Earl of Northumbria. Waltheof grew up to be a devout and charitable man, he had probably been educated for a religious life. The Northumbrians rose in revolt against the tyranical rule of Earl Tostig in 1065, when the thegns demanded that the earldom be granted to Morcar, brother of Edwin, Earl of Mercia. The southern part of the earldom was granted to Waltheof who acquired the title Earl of Huntingdon. Following the Norman victory at Hastings in 1066 Waltheof submitted to King William I and thereby retained his title and estates. Waltheof was among the hostages, along with Earls Edwin, Morcar and Stigand, Archbishop of Canterbury, who were taken to Normandy in 1067 and remained there until mid 1068. Sweyn Astrithson of Denmark, who had a plausible claim to the English throne, invaded Northern England in 1069 to avenge the death of his cousin, Harold II, at Hastings. Waltheof along with his cousin Gospatric, Earl of Northumbria and Edgar Atheling, last representitive of the old Saxon House of Wessex, who had a strong claim to be the heir of Edward the Confessor, allied with the Danes and rose in rebellion, attacking York and destroying the Norman garrison there. Waltheof is reported to have beheaded the fleeing Normans with his great battle axe in the sagas. 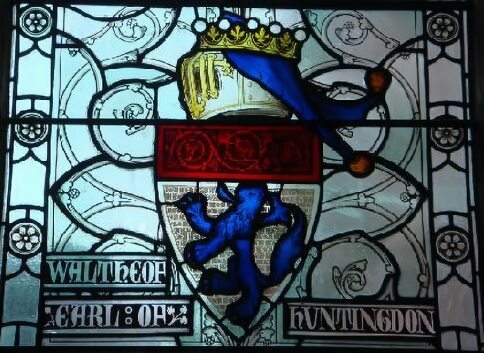 (1) Maud, Countess of Huntingdon married (1) Simon de Senlis, by which marriage she became the mother of Saint Waltheof of Melrose (c. 1100 - 1159/60) (2) David I of Scotland by which she became the mother of Henry of Scotland, 3rd Earl of Northumberland and grandmother of Malcolm IV and William the Lyon of Scotland. (2) Adelise, married Raoul III of Tosny, seigneur de Conches-en-Ouche, Standard Bearer of Normandy. (3) Uchtred of Tynedale married Bethoc; daughter of Donald III, King of Scotland, their daughter, Hextilda, married Richard Comyn, Justiciar of Lothian and became ancestress of the Comyn family. Among Uchtred's sixteenth century descendants was William Tyndale, the first translator of the Bible into modern English. The heroic Hereward the Wake held out against Norman rule at the Isle of Ely in East Anglia, but his rebellion was eventually crushed. In 1072, William expelled Gospatric from the earldom of Northumbria, Gospatric fled into exile, after which he restored Waltheof to his father's Earldom of Northumbria. Waltheof became involved in a long standing Anglo-Saxon blood feud with members of the family who had killed his maternal great-grandfather, Uhtred the Bold, and his grandfather Ealdred. Blood feuds between families in Anglo-Saxon England were a vicious cycle of retribution that often lasted for generations. Uhtred had been killed by Thurbrand the Hold, his son Ealdred subsequently avenged his father by killing Thurbrand, but Ealdred in turn was killed by Thurbrand's son, Carl. Waltheof had his huscarls ambush and kill most of Carl's sons and grandsons. Waltheof participated in the Revolt of the Earls of 1075- the last serious resistance to William's rule in England. The motives for his involvement are uncertain, but he seems to have had second thoughts and confessed his guilt first to Archbishop Lanfranc who advised him to go in person to William, at the time in Normandy. He returned to England with William, the appearance of another Danish fleet in the Humber led William to detain Waltheof in close confinement. 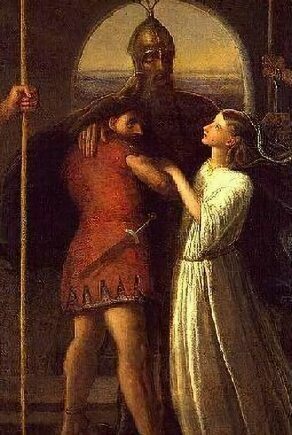 His Norman wife Judith betrayed him accusing him of complicity after which, although Lanfranc insisted on his innocence, he was tried for treason and sentenced to death. All of Waltheof's possesions were granted by William to Judith. and now he has betrayed noble Earl Waltheof. In 1092, after a fire in the chapter house, the abbot of Croyland had the body of Waltheof moved to the abbey church. When the coffin was opened, the corpse was said to be found to be intact with the severed head re-joined. This was regarded as a sure sign of sanctity, and the abbey, which had a financial interest in the affair, did not fail to publicise it. As a result, pilgrims began to visit Waltheof's tomb and miracles were later reported there.